DavoX is creating Videogames, Level design and Sculpture tutorials! I'm a professional level designer with 10 years of experience in the industry. I'm also an artist, script writer, sculptor, painter, etc.! Videogames is what I love to do the most! I have decided to make games on my own, at home, next to my wife and two beautiful daughters! For some time, I was an employee, doing games that bored me a lot :(. I decided at some point that I wasn´t enjoying the thing I love the most, making games! So I decided to follow my heart and make the games I'd love to play instead! "What are you working on right now Leo?" 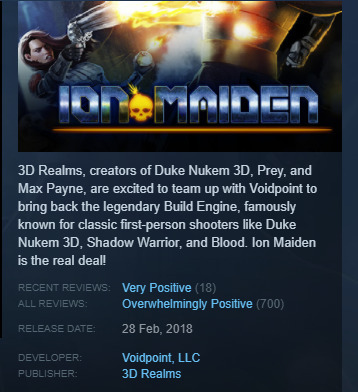 Did you know that currently it shows a 97% overwhelmingly positive review score on Steam? Awesome! "Hmmm I´m almost convinced DavoX, what else do you offer?" I Love making tutorials, timelapses of Level design, design exercises, etc.! So if you help me on my journey, I will make sure to share all my knowledge with all of you! "Why a Patreon page Leo?" That's why I'm asking for your help to create the games and art I'm most passionate about and bring you awesome experiences you are not going to forget! Would you lend me a hand on this adventure? Alright Leo... Where would my money gear towards to if I help you? Work from home 24/7 on videogame design and making tutorials, close to the people I love. Better equipment for faster and more precise development. I'm currently working on an old Quad core :/ I'm really behind the times here, and the best tools require huge amounts of power, specially development dedicated engines like UE4, etc. Better equipment means better tutorial videos! I'll be able to record 1080p videos or even 4k with smooth framerate and a good professional microphone. I´ll be happy along with my family and hopefully you will be too, when you play the levels I make. Of course I´ll be able to do some nice giveaways! Game Keys, exclusive content before anyone else, etc!. I´ll answer your questions whenever you ask me. I want to share my knowledge and experience with all of you. Thanks for supporting me! You'll be able to access my patreon-only posts, view updates and it's likely I'll be able to place you on my patreon credits list, if the game I'm working on supports it or allowes me to. Thanks for being my fan! With this tier you get all previous benefits and plus be allowed to ask general game design questions and vote on my polls. Nice! Thank you so much! Getting serious there! - participate in random game key give aways. - ask me a question to help YOU in your game. Has to be game or level design related. I can't believe it! Thank you! woah! - Participate heavily on what's the next content to be released on my patreon and channel. Be more involved. Your suggestions and feedback matter! You're awesome. What can I say? Words don't matter, let's get to the benefits for you! -I'm also an artist so I can make you a one time drawing of character of the game I'm working on... Signed copy. This is it. You're officially sponsoring a big change in how I provide content to you and all patreons. You're helping me get better equipment, better audio, video, a more powerful PC for developing using the latest technologies. -One time only private streaming covering anything Game/Level design related. -One Key for the game I'm working on (DRM free key, bought by me on the company store to support the rest of the team members) . -I'm also an artist so I can make you a one time drawing of anything related to the universe of the game I'm working on... characters, level layout, sketches, anything. Signed original just for you. Very limited tier! You get to have one specific easter egg about you in the game. Has to be unobstrusive. Should NOT compromise or affect gameplay in any way. It's very important that it also goes through the team OK and approval, if it's not met, money will be given back. - Two DRM free keys for the game I'm working on. Bought directly from the company store to support the rest of the team members. Once keys are used then the option for refund is disabled so better wait on that. This goal is a great start and will help me and my wife buy our kids whatever they need. It will definitely take a huge weight off my shoulders so I can concentrate more on making an awesome game!